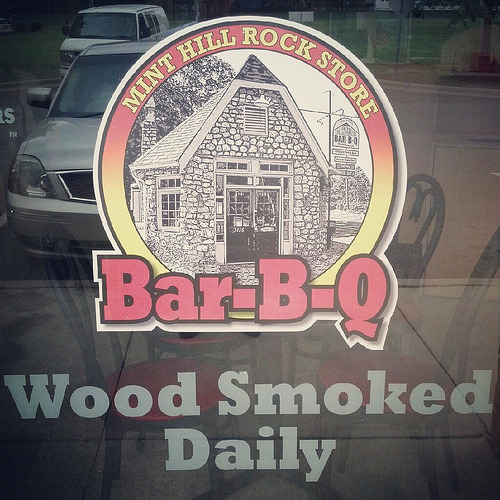 Trying to take feedback from Speedy to heart, on this visit to the Mint Hill location of Rock Store Bar-B-Q (click here for the review of the original Stallings location) I ordered a combo platter of both BBQ pork and brisket. I still haven’t had the ribs at either place, so while I made some effort, I fear that it will all be in vain in the eyes of both Speedy and Rudy. As opposed to the original location, a stand-alone historic gas station structure, the Mint Hill restaurant is located at the end of a strip mall in what looks to have been a former Jersey Mike’s (I tend to have a keen eye for Jersey Mike’s since Speedy and I worked at one in high school for several years). 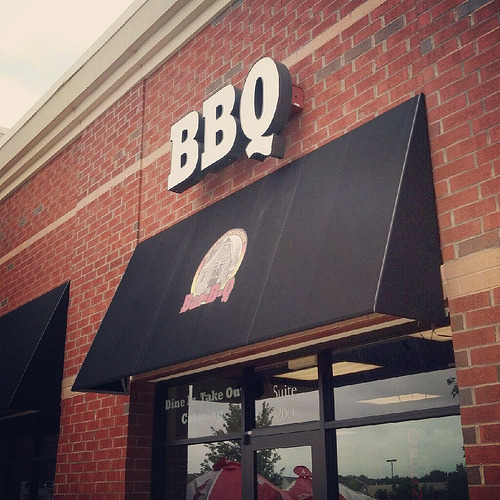 As you walk up to the front door to this location, you are greeted by a decal that states “Wood Smoked Daily” before you actually do get a whiff of smoke when you enter the door. I still wasn’t able to determine if this is due to the use of a stick burning smoker or an electric or gas burner with wood chips. However, I remain skeptical of there being a stick burner in a strip mall, so I am still working off the gas or electric smoker theory. 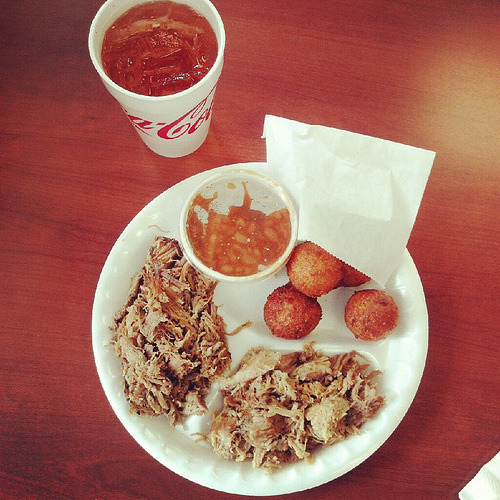 Nevertheless, I walked up and ordered a BBQ pork combo plate, adding brisket with my two sides being hush puppies and beans. 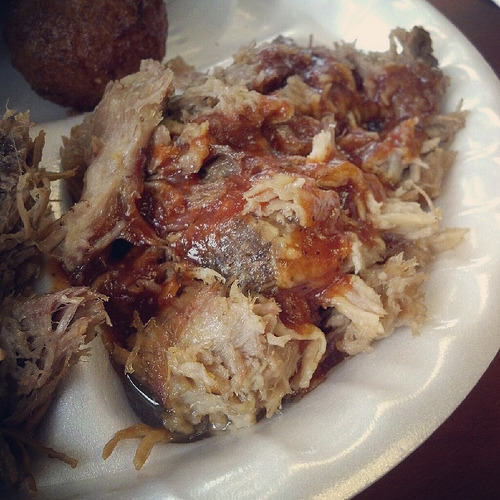 Unfortunately, the pork was as dry as the sandwich at the original location so again, sauce was a must. A healthy dose of their tangy Stallings Secret sauce worked best with the pork, but I did notice a pool of grease collecting at the bottom of the styrofoam plate. 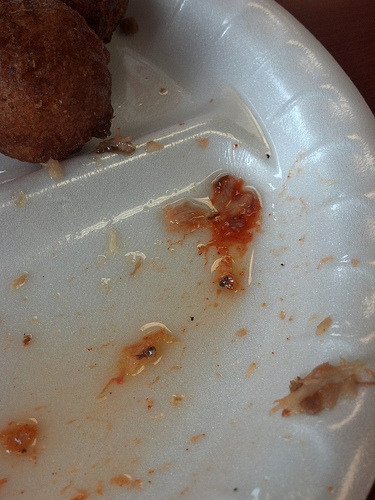 Not the most appetizing visual for lunch. As I suspected from my visit to the other location, the brisket here is actually coarsely chopped in the same manner as the pork. And it is just as dry. To my surprise, I found that the Carolina Gold mustard-based sauce actually worked best with the brisket but overall it was pretty unremarkable. However, thankfully there was no pool of grease here. 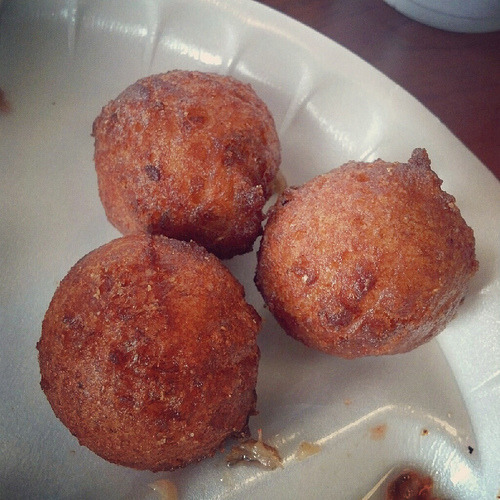 The hush puppies were a nice surprise, as they weren’t available at the original location. They were big and fluffy and the best part of the meal. 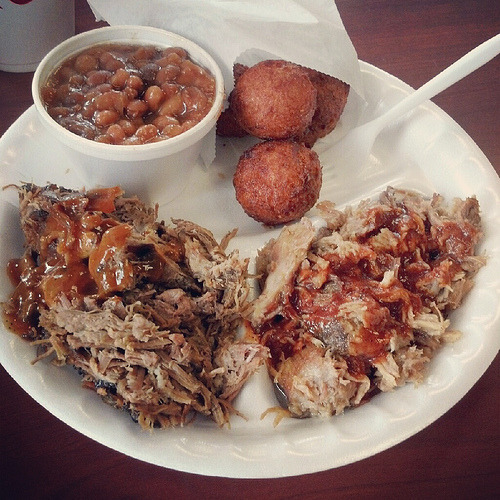 The BBQ beans were passable but I didn’t eat too much of them, focusing on the meat and hush puppies. So while this time around I did get more than my usual portions in the interests of the Barbecue Bros and left with a full belly. 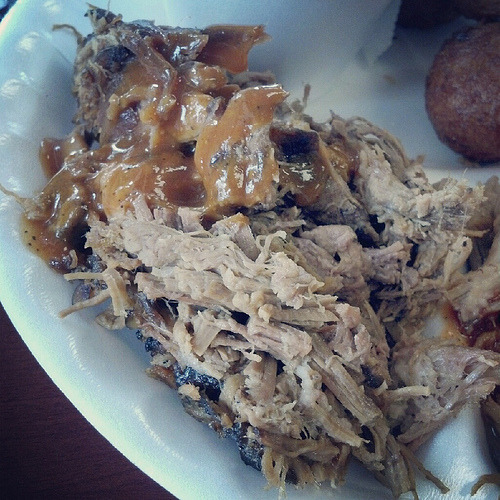 Unfortunately it was a belly full of average-at-best barbecue.